Halloween has come and gone once more, leaving in its wake scary sugar crashes, horrific hangovers and countless photos commemorating how silly/scary/awesome/unfortunate we looked last night. It's time to share. Since I have kids, I no longer have to dress up for Halloween. Instead I get to plan elaborate costumes for my twin boys that reflect my interests. Then I procrastinate until I find myself at Party City on Halloween morning, buying toddler-sized cop-outs in green and red. The original plan was to have Archer "Tantrum" Fahey be a Red (rage) Lantern and Seamus "It's Mine" Fahey be an Orange (greed) Lantern . 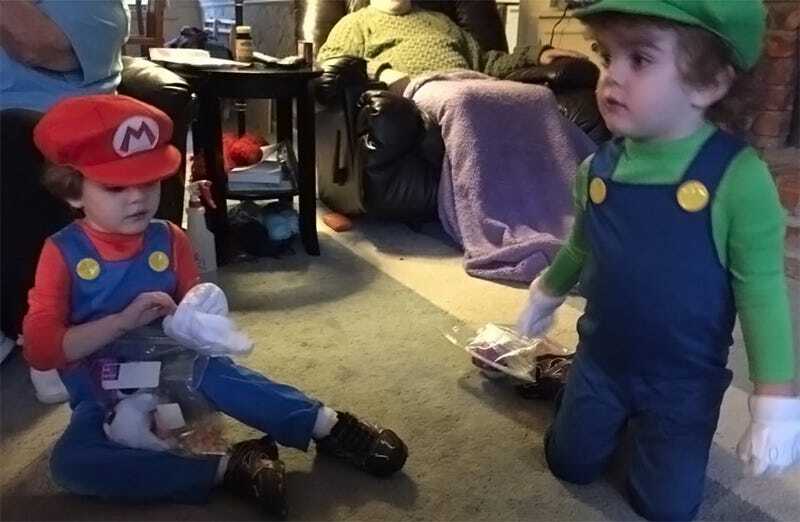 On the way to my brother-in-law's safe trick-or-treating neighborhood I realized I still could put the Green Lantern and Red Lantern symbols on their Mario and Luigi costumes, but it was too late. My wife wore my nephew's Teemo hat and a Batman dress. I wore my threatening father clothing and an expression of intense pain after ten minutes of being a six and a half foot tall man holding the hand of a three foot tall child. Surely you did better than we did. Show us in the comments section.